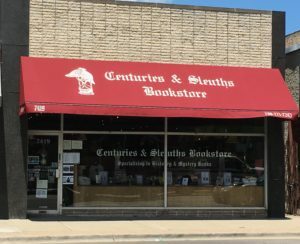 Centuries & Sleuths Bookstore, 7419 W. Madison Street, Forest Park, Illinois 60130. I’d like to tell you about a Korean War veteran I met at my book signing this past weekend at Centuries & Sleuths Bookstore in Forest Park, Illinois. His name was Don, and he came to the event with his wife after hearing about it through a local veterans organization. I was talking to a colleague I had just signed a book for when Don came over to my table and pulled up a chair. He had been quiet all through my author presentation, apparently content to let others ask the questions about my new book. Now with me one-on-one, it was his turn to talk. Don told me about his time in the Army, which spanned several decades. He was a Teletype operator in Japan during the Korean War. He could type 98 words a minute, averaging only 1 keystroke error – and that was when typing wasn’t quite as ergonomically friendly as it is today. He showed me his fingertips, warn smooth from his nonstop typing, day after day. He typed classified intelligence reports, which were relayed to Washington so the brass could assess the war’s progress. Don was one small, but essential, cog in the American war effort. He is immensely proud of his service. Meeting veterans like Don energizes me. They are men and women just like you and me, but they did something extraordinary by serving our country when it needed them most. Whether their weapon was a rifle or a Teletype, they helped write the history of the United States one person at a time. Without the collective sum of their efforts, we would not enjoy the freedoms we do today. That’s why I salute them. I’d also like to shout-out for Centuries & Sleuths Bookstore. It’s the kind of friendly neighborhood shop you can’t help but get lost in, even though its sales area is like a big open parlor room from days gone by. If you’re a regular, I guarantee you Augie and John, the store’s proprietors, will call you by name when you come into the store. If you’re not a regular, you soon will be. They’ll make you feel comfortable and at ease, like you are meant to be there and you’ve got all the time in the world. Books line every wall from floor to ceiling, neatly shelved in just the right place so they’re accessible and easy to peruse. And that’s just what the store’s customers do – wander slowly from one shelf to another, looking for just the right fix of history or mystery to hold them over until they inevitably wander by the storefront again and get sucked in just like they did before. 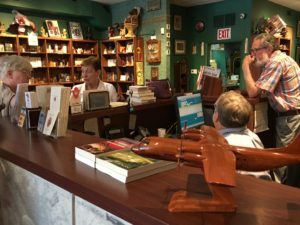 Centuries & Sleuths Bookstore is a hidden gem you won’t want to miss. Watch next week for the first Voices to Veterans Spotlight, and don’t forget to nominate a veteran you know for recognition by sending the veteran’s name to me at VoicesToVeterans@gmail.com. Those selected for the Voices to Veterans Spotlight will receive a free signed copy of Sapphire Pavilion. 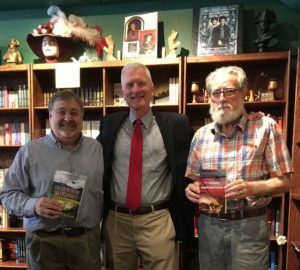 Augie and John with me at Centuries & Sleuths Bookstore.